Stephen Adly Guirgis is an over-the-top playwright whose work flails about in every direction, often confusing, occasionally silly, riotously funny, thought provoking, frustrating and always entertaining. A couple of years ago, CustomMade Theatre produced “The Last Days of Judas Iscariot“, which I described as “all over the place” and noted that it tries, perhaps “to do too much”. Nevertheless, that production won me over, as does the current “Motherf**ker With The Hat”. Like an exceptionally talented comedian who never knows how to turn it off, Guirgis manages to be irresistible even as he is driving us nuts. When “Motherf**ker” hit Broadway in 2011, the reviews were mixed at best. And yet the production was nominated for multiple Tony awards and won Theatre World, Drama Desk, and Outer Critics Circle awards. It seems one feels about the play like one feels about the obscene title: attracted, but ambivalent. In a program note, director Bill English correctly observes that Guirgis is always concerned with spirituality—his characters are “trying to find their way on a spiritual agenda”. In “Judas Iscariot” he took on the spiritual adventures of characters from the Gospels and the two mellenia of Christian tradition. In “Motherf**ker With The Hat” his very confused addict alcoholics are trying to maintain themselves in a 12 step program. Gabriel Marin as Jackie, Rudy Guerrero as Cousin Julio, Margo Hall as Victoria and Carl Lumbly as Ralph D. in “The Motherf**ker With The Hat” at San Francisco Playhouse. Photo credit: SF Playhouse. The likable parolee Gabriel has been clean for a while and has just found a job. His sympathetic girlfriend Victoria continues to use, although, in some ways, she seems to have her life and emotions more together than her recovering boyfriend. When Gabriel notices a strange hat in the apartment, all hell breaks loose. He is determined to find the motherf**ker who left his hat, correctly surmising that Victoria has been cheating. Gabriel’s adventures in learning about the hat and its meaning take him to interact with his program sponsor Ralph, a cliche-spouting, health drink swilling, charismatic hypocrite who has, nevertheless, been clean for more than a decade and seems to genuinely care about his sponsee. The sponsor’s resentful wife is a study in not-so-repressed anger. At one point, after Gabriel shoots the hat, the two men have to hide the gun and seek help from Gabriel’s charming, loving and eccentric cousin Julio who is a cross between Ricky Martin and Jean-Claude Van Damme. Rudy Guerrero’s hilarious portrayal of Julio practically steals the show. Guirgis handles this farce well with many twists and turns and surprise developments that keep our interest throughout. But the strongest aspect of this play is its insightful, affectionate and respectful sendup of the recovery subculture. Audience members with 12 step experience will cringe and laugh with delighted recognition. Both haters and lovers of that subculture will leave feeling vindicated and amused. The performances are all excellent, with each character having moments of comedic shine. Bill English’s direction is fast moving and easy to follow. As always at SF Playhouse, all of the design elements are conspicuously good. 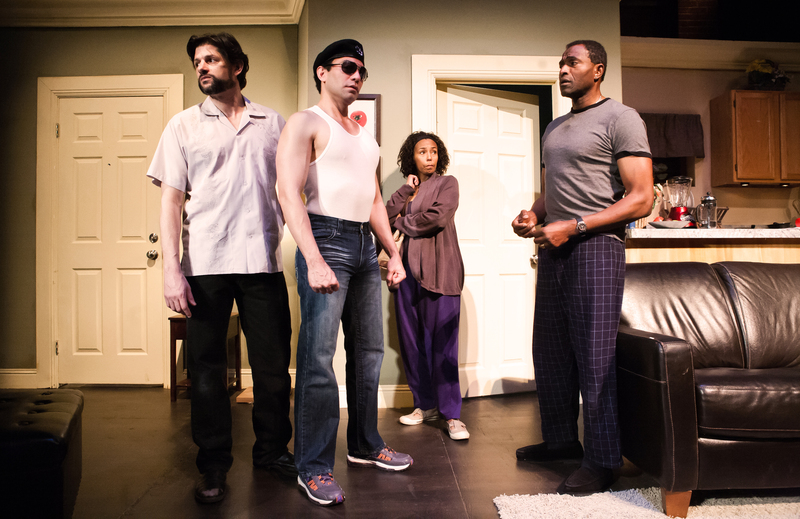 “Motherf**ker With The Hat” by Stephen Adly Guirgis , directed by Bill English, produced by San Francisco Playhouse. Set Design: Bill English. Lighting Design: Jordan Puckett. Costume Design: Abra Berman. Fight Director: David Maier. Sound Design: Ryan Lee Short. Victoria: Margo Hall. Jackie: Gabriel Martin. Ralph: Carl Lumbly. Veronica: Isabelle Ortega. Cousin Julio: Rudy Guerrero. Posted in Reviews.Tagged Bill English, Motherf**ker With The Hat, SF Playhouse, Stephen Adly Guirgis.